This is book number sixteen in the “Home Repair is Homicide” mystery series. Wait a minute … #16? For real? Why have I never heard of this author or this series? Well, probably because it’s a ‘cozy’ mystery and I’m not such a big fan of those (I only came to realize that well after I requested this ARC). We’re in the town of Eastport, Maine and there’s a big storm a’comin’. Locals and tourists are making plans for taking cover when the teen beauty pageant winner is discovered murdered in the steeple bell tower of the town’s old church. Jacobia “Jake” Tiptree is a local home renovator and part-time amateur detective. She of course takes an interest in the murder of the troubled teen, but her interest grows to concern when a guest in her home is a leading suspect. It is not unusual for me to pick up a book to read and only later discover that it is a later book in a series. Sometimes I can tell just by reading the book that I’ve missed out on a lot of information previous given about a character. Sometimes I get everything I need to know and reading an early book will help round out a character’s identity, but it’s not essential to getting in to a series. This book is the former. There are so many characters here – and many of them seem interestingly unique (that old-world Maine charm), but we don’t get to know any of them. I assume, since the series has lasted so long and the characters interact as though they’ve been around, that the character personalities have been established in earlier books, but this does nothing to help me here, now, with this my first volume. Jacobia Tiptree’s “Home Repair Tips” are fun and she feels like a character that I could enjoy, and I do get the sense of why this has been a long-running series, but this book (published in 2013 and the last book in the series) just hasn’t hooked me or made me want to go back and read any of the earlier volumes. The characters were unique and the setting desirable, but this book didn’t hold my interest at all. Looking for a good book? 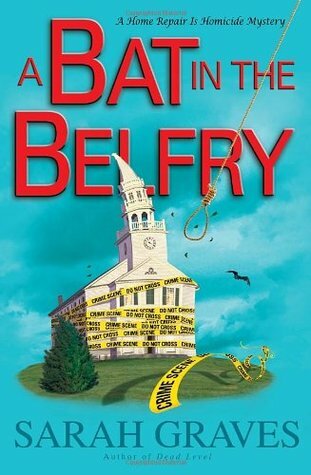 A Bat in the Belfry by Sarah Graves is the sixteenth (and last?) book in the Home Repair is Homicide series and it is not a good place to start . Fans of the series will want to read on, but those with only a passing knowledge of the series (or no knowledge at all) should probably look for something else.